Lyndsey Walls has been interested in being a real estate agent since high school, but it wasn't until a REALTOR® from F.C. Tucker Emge sold her house that she realized it was time to fulfill that dream. 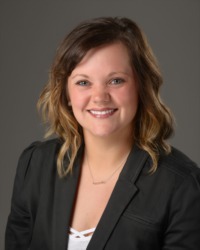 A graduate of North Daviess High School and Indiana University with a Bachelor of Science degree in Public Health, Lyndsey was the social services director for a nursing home for 6 years. While there, she was able to develop excellent customer service skills in listening, patience and empathy working with different personalities. Those skills will definitely transfer easily to her new career in real estate. Lyndsey also has experience working with disabled children and adults while at the Easter Seals Rehabilitation group homes in Evansville. Although she’s lived in Indianapolis, Evansville and Bloomington, this small town girl is back home in Odon, Indiana with her husband Jesse and their 3-year-old daughter. Lyndsey is kind-hearted and used to putting clients’ needs first which make her perfect for your next real estate move! Talk To Lyndsey Walls at 812-259-1389!